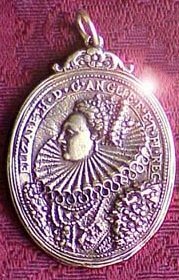 This medal was ordered struck by Elizabeth I in 1589 to commemorate the defeat of the Spanish Armada. The obverse features a profile portrait of the queen, surrounded by a latin inscription indicating her title. 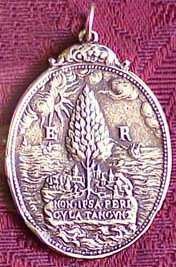 The reverse features an island on the sea with a large bay tree towering over a town, bearing the latin inscription, "Not even perils touch it." To the right and left of the bay tree are the initials "E" and "R" which represent "Elizabeth Regina." This beautiful medal could be worn on a ribbon or a chain. Our brass reproduction gives the look of the bronze original.